Punk music is a cri de coeur about being an outcast in a society that does not quite get it. 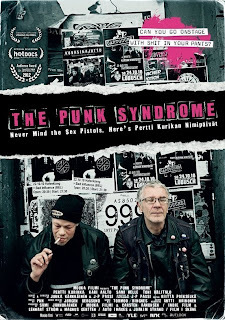 THE PUNK SYNDROME, a new film from Finland by J-P Passi and Jukka Kärkkäinen that is competing at the AFI-Discovery Channel Silverdocs Documentary Festival in the Sterling World Competition, takes that mantra to an extreme as it chronicles the members of Pertti Kurikka’s Name Day, a punk band made up of mentally challenged young people. The film, making its U.S. Premiere, was awarded the Swiss Post Award for Most Innovative Feature Film at the Visions du Réel in Nyon, as well as sold-out screenings at Hot Docs and the Sheffield Doc/Fest. The four band members rage against the way they are treated by society (much like any other punk band) but these mental disabilities make their rage all the more intriguing. Variety praised the film as a telling tale of human nature, “demonstrating the thin line between so-called normal people and those on the fringe”, stating that it could well become a cult hit. Previous work by directors Jukka Kärkkäinen and J-P Passi include the award-winning THE LIVING ROOM OF THE NATION (2009), which had its North American premiere at SXSW in 2010 and was shown in New York’s Museum of Modern Art last year as part of DocPoint NYC. For more information, visit: www.thepunksyndrome.com.